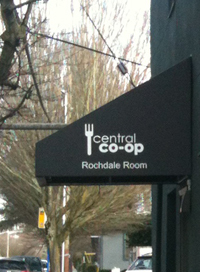 Central Co-op unveiled our beautifully-remodeled community space in 2014, and dedicated it to the Rochdale Pioneers. Read on for the story of the Rochdale Room’s name and the green details that went into its renovation. In the year 1844 in Rochdale, England a group of 28 locals formed a cooperative business that would become the model for consumer co-ops today. The group formed at a time when many cooperatives were short-lived and, determined to design a model that would succeed, they developed a set of principles and values to guide their operations. Their efforts were rewarded. The principles and values they laid down sustained their co-op well into the 20th century when, in 1976, the Rochdale Society of Equitable Pioneers merged with a cooperative in a neighboring town. The work of the original Rochdale Pioneers has flourished and continues to bear fruit. The Rochdale Principles offer such a strong framework for cooperative organizations that they were adopted and adapted by the International Cooperative Alliance, and have come to define the cooperative movement. Cooperatives are based on the values of self-help, self-responsibility, democracy, equality, equity and solidarity. In the tradition of their founders, cooperative members believe in the ethical values of honesty, openness, social responsibility and caring for others. Zero-VOC, Carcinogen-free paint: For this space which is frequently used for day-long trainings and classes, we knew it was important that the space itself feel lively and inspiring, so we chose paint colors from the Portland-based company YOLO Colorhouse. YOLO Colorhouse is owned and run by two women who bring their collective design expertise and concern for health and environment to the products they create. Their color palette is inspired by natural elements and their paints are free of carcinogens, mutagens, hazardous air pollutants, ozone depleting compounds, formaldehyde, phthalates, and volatile organic compounds (VOCs). Not only is YOLO Colorhouse paint safer for indoor air quality, but the manufacturing and operating practices of the company are extremely “green” as well. For example, they were the first paint company to join the US EPA SmartWay Transportation Alliance, and the water used to rinse tanks gets recycled back into paint rather than washed down the drain. Their distinctive color palette also makes it easy to choose color combinations that coordinate well together. The colors featured in the Rochdale Room are Dream .05 and Air .03. Learn more about this innovative company at www.yolocolorhouse.com. LED Lighting: We have replaced all of the lighting in the Rochdale Room with LED bulbs, from the vanity in the WC to the new track lights. These bulbs use a fraction of the energy of incandescents and significantly less than fluorescents. Not only do they provide a better quality of light than CFLS, they don’t contain mercury, so LED bulbs are much safer choice in handling and in disposal. Far InfraRed Heaters: The heaters which are newly installed in the space are from a Washington State company called BioSmart, and unlike typical space heaters, they use far infrared heat waves (much like the sun). These heat waves interact with water molecules in the air to heat the space evenly from floor to ceiling - without drying out the air. These heaters are very energy efficient, and far infrared heat is so healthy that it is the heat source of choice for infant incubators in hospitals. The units that we installed go one step further and feature built-in air-purifiers. Reclaimed Cabinetry: The cabinet and countertop substrate we purchased for the new space (under the sink) are recycled. We purchased them used from Second Use Building Materials, located in the Georgetown neighborhood. Renewable Materials: The plaques and signage, as well as the new table tops for the space are all made from bamboo - which is considered a rapidly renewable resource because it takes less than a decade from the time it is planted to the time it can be harvested for use. This room was remodeled to feel even more comfortable and fun to be in, and to be a space that represents and supports our cooperative community. But you don’t have to take our word for it! To see for yourself, join us for one of our events held in the Rochdale Room – check our calendar to see what’s coming up. How to get here: The Rochdale Room is located on the first floor of our office building, at 1900 E Madison Street. The entrance is on 19th Avenue, north of the office entrance. There is street parking in the neighborhood, and several Metro routes stop within a block. Accessibility: Our Rochdale Room is wheelchair accessible, and the restroom door has a lever-style handle. Please let us know how we can make the space more accessible and accomodating.